A senior grading in Kyokushin Karate was held at Turramurra Dojo on Saturday June 9th. The grading was chaired by Hanshi Howard Lipman, with Shihan Rick Cunningham, Sensei Mark McFadden and Sensei David Craigie also assessing participants. Taking students through the techniques for the grading was Shihan Peter Olive. Photography and videography was by Sempai Jonathan Lee, and a shots few by Sensei Mark Shelmerdine. KIMAA karateka from Turramurra, Annangrove, Lismore and Young dojos converged on Sydney to attempt various senior kyu grades. Sensei Alex Lloyd during the grading. The grading was the usual gruelling six-hour Kyokushin text of technique, stance, knowledge, fitness, focus and commitment. Students were tested thoroughly on kihon (basics), ido geiko (movements through stance), advanced techniques, bunkai (application), kata (form), terminology and other surprises Hanshi Lipman threw at the students. Sempai Jasper Choi during the grading. The day ended with kumite (sparring). Most notable was Jasper Choi, attempting his first black belt grade, who endured the legendary 40 fights. All students passed their grading. 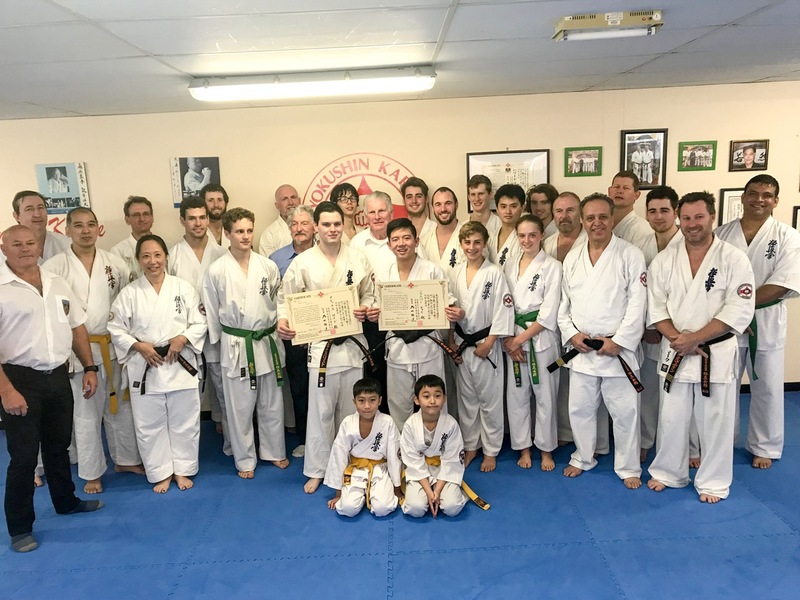 Among the grades, two black belt grades were awarded: Sensei Alex Lloyd was promoted to Sandan (3rd Dan), and Sempai Jasper Choi attained his Shodan (1st Dan). Congratulations to all students who participated. Thanks go to the KIMAA Yudansha who attended the grading to support and fight those being tested. Group shot after the grading.